When I wanted to paint the doors of our house black my husband strongly urged me not to do so, so when I tried Plan B: to paint the moldings black, my husband once again urged me strongly not to do so. When I asked him his reason for this definitive acrimony for the color black he simply stated that he felt black was a depressing color, a color of death and so on. 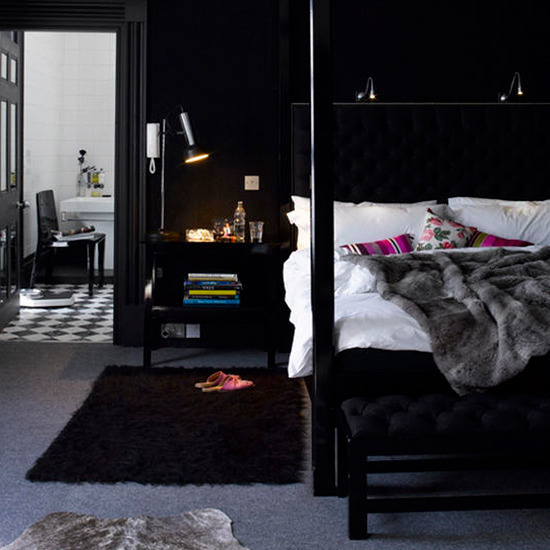 Black may be linked to many negative connotations and in many ways this link is very true but that doesn't mean black can't be a wonderful color for the home, in truth, using black in the home can be quite chic and even charming. Painting the door(s) glossy black can be quite the way to make a chic statement and also a wonderful way to incorporate black with standing power without having to have black walls (which for many can be a bit over-whelming, especially if it's the first time your using this color). 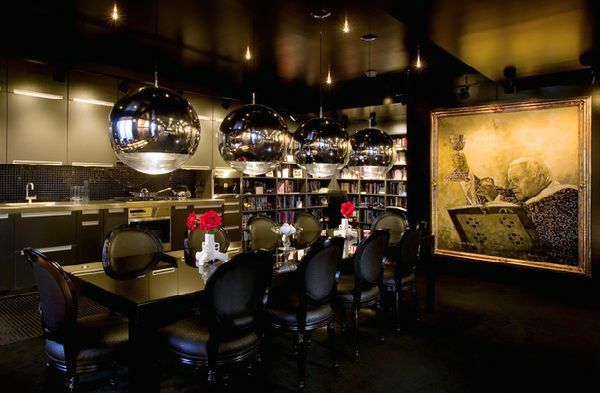 With black doors a simple black accent here and there in forms of pictures frames, shelving and even a wall full of black and white photos can really tie the room into a black-color theme that is exciting and smart. 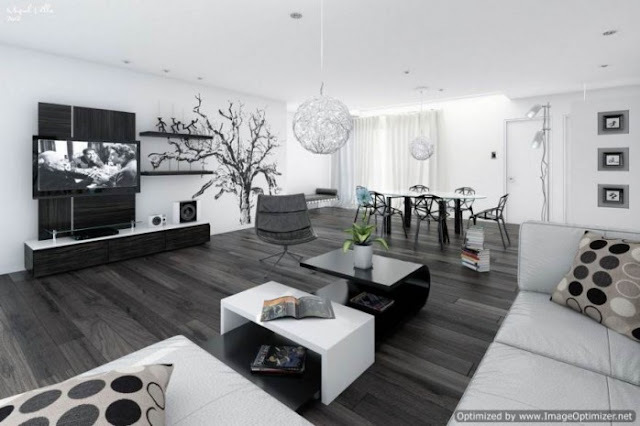 Using black as an accent to one large space is not only a great way to incorporate the color with the lease amount of work but it's also quite chic. Try an accent wall or even better (as pictured below) accent flooring! One of the great aspects of taking the route of accenting with the color is that you'll find that you have more options when figuring out the decor style of the room (ie modern, rustic, etc.) and it will also give you more free reign on incorporating a variety of other colors if you wish to do so. The pairing of mahogany and black is glamourous and exquisite, pairing the two can cover a wide spectrum from rustic (pictured above) to eclectic high-end living (pictured below). 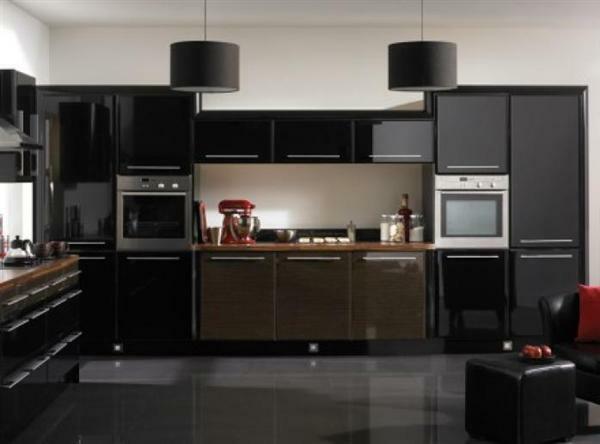 Although it's no favorite of mine modern minimalism is probably one of the most popular ways to use black in the kitchen. Using reflective black (or better known as glossy black) in the kitchen can be quite exciting in that the reflective black can really amp up the look of the kitchen creating an almost futuristic vibe even in contemporary kitchens (as seen above). When comparing the picture above and below one can compare and contrast the similarities and differences of the kitchen. 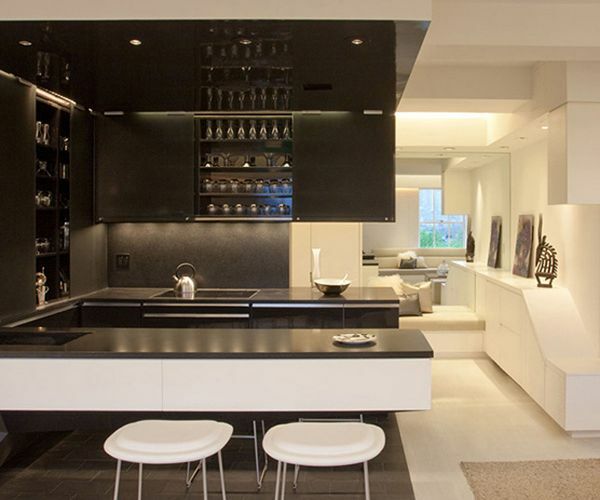 Both kitchens which have reflective black surfaces are switched in floor colors and ceiling colors; the kitchen pictured above has matte white ceilings and a reflective dark gray floor while the kitchen pictured below has a reflective black ceiling and matte white flooring. The matte of the white ceiling creates a more closed-in atmosphere while the reflective black ceiling make the space feel more open and grand. I find this comparison to be quite interesting since it is normally the darker colors that create the illusion of a smaller space, just goes to show the power of gloss. 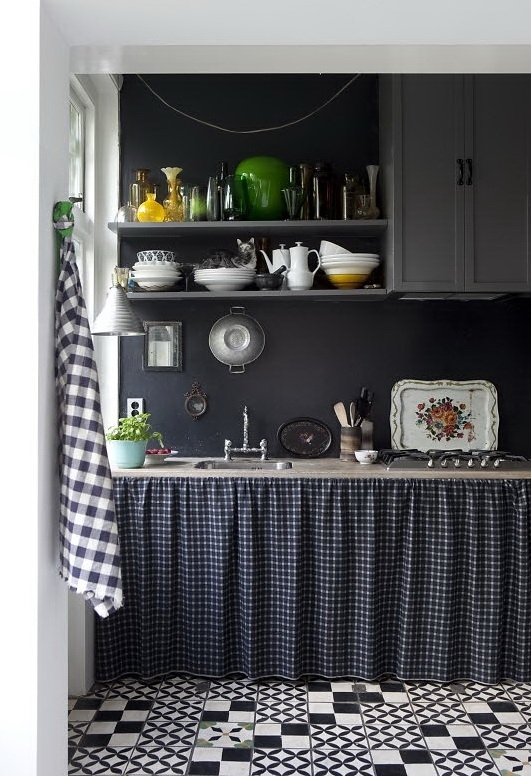 My favorite use of black in the kitchen is pictured above, the rustic-styled kitchen. I honestly didn't think using black to create a rustic kitchen was possible, but it is! The two tones of black: the black walls and dark gray shelving and cabinets creates depth and a feeling of space, the black and white kitchen floor tiling are in a couple different styles, but the combination of different tiles being used creates the feeling of a fun, creative space. Not all teens with black walled rooms are going through teen-angst. There are plenty of youthful prints and materials out there to scream teen-chic rather than "I lock myself in my room and play tearful hate music on my free time" for example, the checkered print, a vintage yet youthful print that is fantastic for teen rooms. 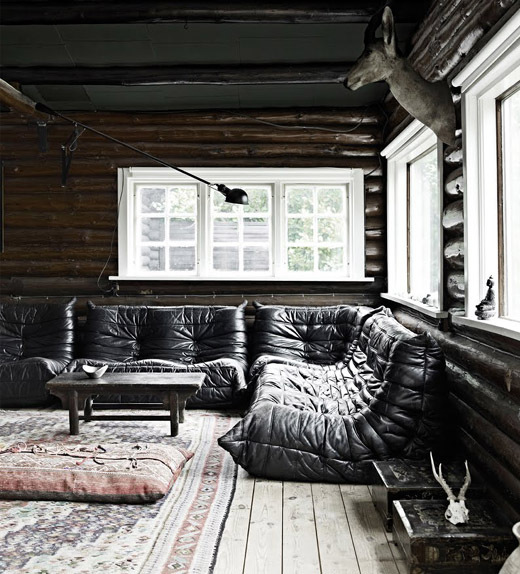 Silver or anything close to is a great material that is youthful and goes well black in teen rooms. Pops of bright color is another great way to incorporate fun and teen rooms can totally get away with most colors that are simply strewn about. And while some parents are debating with their teens about their black rooms these same mas and pas won't think twice about saying "NO" to their baby's nursery being black. Who would want their little mini-me to be influenced by the negative nature of the dark color?! Well, there are ways to brighten up black. And there probably is no better way to make a statement than taking black and turning it around. 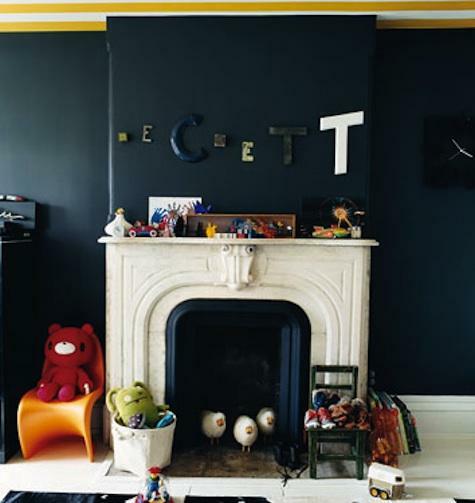 A few adorable, smart and chic ways to use black in the nursery are pictured here. When using an accent color for the black nursery, yellow is always a great color; so bright that even black loses it's dull negativity, when paired together yellow is more robust and popping and black seems to be the accent. Leaving the white ceiling is another common trick to keeping the space looking a little less black and more open. Of course, fun prints and bright colors help a lot too. 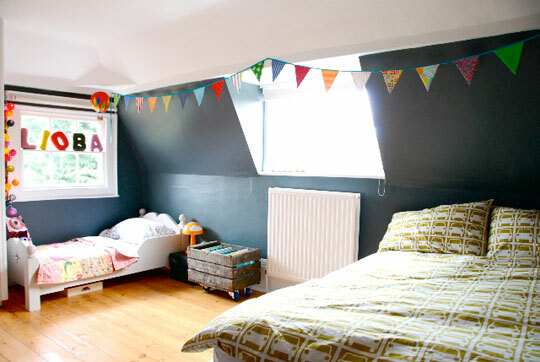 And by golly don't forget about wall paper, stencils and other fun ways to use black. Wall paper is a great way to incorporate print over a large space. The black and silver floral wall paper can catch people unawares but it is never-the-less quite beautiful in its non-traditional way. 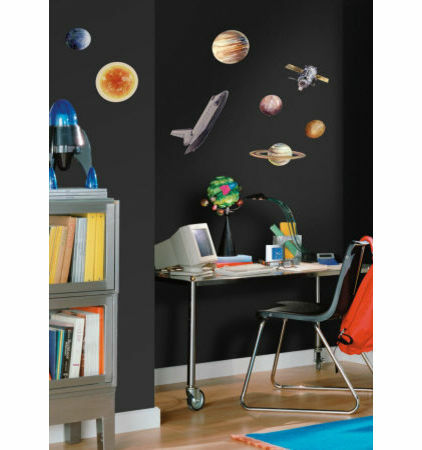 Contemporary wall papers (such as the one pictured below) of the alphabet is fun and can easily transform a rather plain space.